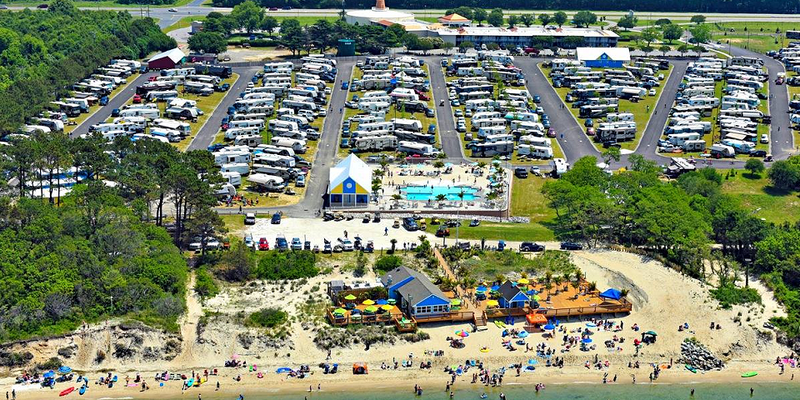 Cape Charles/Chesapeake Bay KOA is probably the most under rated campground that we have stayed at this year! The facilities are immaculate, The sites are wide enough and sort of level, the hook ups are easy to access. All of the employees are nice and friendly. We will be back!! I am 41-feet long and I fit perfectly in our site. If I were 2-3 feet longer I would have to have backed in at more of an angle. It was wide enough for us to “live outside”. In regards to the level-ness of the sites they are ok and may require some modifications. Once I backed in I used my leveling system to let me know where I would need help (press the on button and the yellow arrows will let you know). I utilized my jack pads under the tires to get almost level, then emptied the air bags and then hit auto level and I was set. We saw a Super-C (super nice unit) that had the front wheels up on cinderblocks (I would be afraid of something slipping and breaking :-(. Let’s face it you can have the best sites, with the best views, at the lowest prices but if the staff is a bunch of curmudgeons then you won’t go back. Our staff interactions from the time that we finished paying for our reservations (more on that below) until the time that we checked out have been very positive. It seems as if each employee enjoys working here.